Vladimir Liubomirov's Bronenosec Sailing Team prevailed today at the conclusion of the 2015 RC44 Match Racing Championship held on the idyllic waters of Virgin Gorda's North Sound in the British Virgin Islands. Bronenosec Sailing Team started the day with a two-point advantage over Torbjörn Törnqvist's Artemis Racing in second, and, alongside Igor Lah's Team CEEREF, was the top scoring boat today. She dropped just one match, in flight five, to Team Aqua. Liubomirov's team ended the day four points clear of Team Aqua, which ultimately took second in the 2015 Match Racing Championship, one point ahead of Artemis Racing. Sadly having otherwise been on board every day this season, Vladimir Liubomirov was unable to helm today. So steering for the match racing was Michele Ivaldi, who usually calls tactics and who was carrying out both roles on board today. "It feels very good," beamed Ivaldi. "Before we used the match racing for training, but we have been doing well season-long. So winning it wasn't a goal at the beginning of the season, but it became one. Personally, I love match racing - it is such good training for the crew." The Italian tactician attributed today's success to the team effort on the part of Bronenosec's crew. "Our manoeuvre today were almost perfect in every area. If you have strong crew work, half of it is done." Ivaldi only learned he would be helming last Saturday, but said he thoroughly enjoyed the experience. "I'm not used to driving, so it was hard for me to do that and tactics at the same time, but I had the help of Flipper [Paul Westlake], Cicho [Maciel Cichetti] and Alby [Alberto Barovier] downwind. Everybody was trying to cover and work their new positions." Standing in for Vladimir Liubomirov on board today was young local sailor, Mark Stephenson. Today seven flights were sailed in winds that peaked at 15 knots before dropping to 6-7 mid-afternoon and becoming increasingly shifty and puffy. As Ivaldi put it: "There was not a clear side of the course to play so you had to keep your head out of the boat. You had to mix match racing and tactics and sometimes you had to split and go with what you saw on the water." This made for plenty of opportunities and passing lanes. Igor Lah's Team CEEREF was also a stand-out performer. 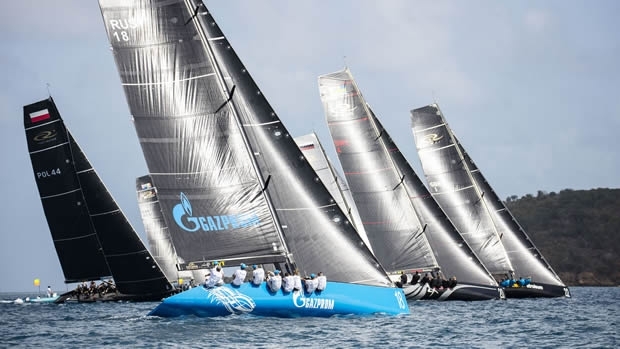 Having missed the RC44 regatta in Marstrand, Sweden, this summer, today was the first occasion the Slovenian team has match raced since the Audi RC44 Porto Cervo Cup in June. As the team's British tactician Adrian Stead described it: "There were a couple of things that lost us races early on, but we worked hard at them and it felt like we were pulling them off better than we were before." Team CEEREF nearly came to grief in their match against Artemis Racing when they picked up a pre-start penalty. However thanks to a couple of shifts going their way on the first beat, they had pulled out a sufficient lead to carry out their penalty turn on the second beat without being caught by the Swedish team. On Team Nika, Vladimir Prosikhin also had his best match racing day of 2015, claiming four wins, aided by America's Cup winning helmsman, Ed Baird, who is calling tactics for him for the first time in Virgin Gorda. "It's a gorgeous place - nice sailing, enjoyable, very nice breeze. We had close racing and that was exciting," said Prosikhin of today's racing on North Sound, where the regatta is being hosted by the Yacht Club Costa Smeralda at their Caribbean base here. This being the first time he has raced with Baird, Prosikhin admitted having had some communication issues with his American tactician and this had helped caused them to pick up a penalty in the match against Team CEEREF. "Our communication link is not perfectly established yet, but I am happy with how it is going." Aside from the racing there was additional drama when there was man overboard on board John Bassadone's Peninsula Petroleum Sailing Team during their race with Team Nika. Showing that even top sailors are fallible, during a rapid manoeuvre former Spanish America's Cup bowman Miguel Jauregui, slipped and tumbled overboard. He was picked up an umpire RIB and deposited back on board unhurt, but it cost the Gibraltar team the race. "I tried to hang on but it was impossible," admitted Jauregui. The first of four days of fleet racing commences tomorrow.